When Jennifer Baker was in high school in Texas, no one discussed a possible future in Management Information Systems (MIS). Now that she’s a junior at FIU working on a bachelor’s degree in MIS, she’s determined to spread the word: MIS is a field high school girls should take seriously. Baker is the current president of ITWomen NextGen, an organization in the College of Business that is working to increase the number of women in the fields of technology and engineering. 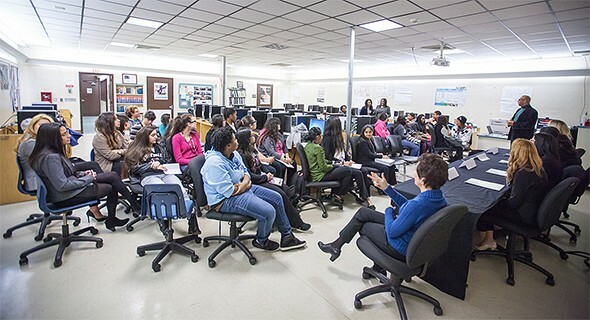 ITWomen NextGen held a four-woman panel discussion entitled “MIS Careers: The Jobs of Tomorrow” for 40 female high school students enrolled at the Miami Lakes Educational Center (part of Miami-Dade Public Schools), on Feb. 20. Baker, who is now working on a bachelor’s degree in Asian Studies as well as MIS, welcomed the opportunity to mentor younger women. FIU instructor Simpson said the audience was very receptive to what the FIU students were sharing. Also on the panel were FIU MIS majors Alana Ascanio, Ana Marinez and Laura Smith, the founding president of ITWomen NextGen, the first college chapter of ITWomen, a not-for-profit organization based in South Florida. A disproportionate number of people in MIS are men. According to a 2012 Forbes estimate, women are only 26 percent of the field. But it’s a field less troubled by gender parity than others; women’s earnings are 97 percent of men’s earnings. Cousins reported that 30 out of the 40 attendees requested more information about an “MIS boot camp” for high school girls to be held at FIU this summer.